FORMER CIA ASSET ON LIBYA "REBELS"
Cassion is a watertight chamber open at the bottom and containing air under pressure, used to carry out construction work under water. 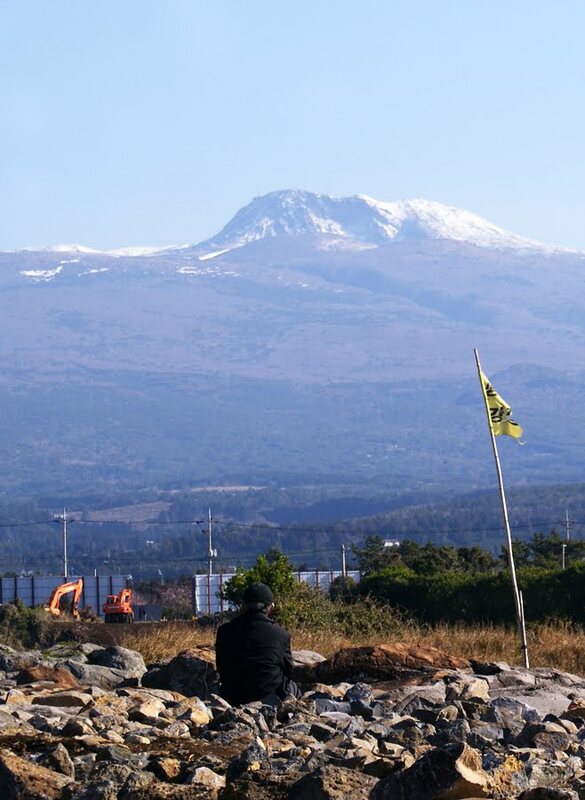 SPARK members took this photo at Hwasoon harbor on the way to Gangjeong village after the picketing the governor in Jeju city. The cassion is 20 meters high, almost like apartment bldg height, and people say 57 caissons would be necessary to fill the Gangjeong sea to build the docks for visiting U.S. warships. A large delegation from SPARK (Solidarity for Peace & Reunification of Korea) flew from Seoul to Jeju Island for a weekend protest against the Jeju governor and the Navy base now being built in Gangjeong village. While in Jeju they will visit Sung-Hee Choi at her jail house and also see Professor Yang who is still recovering from his recent 70-day hunger strike that nearly took his life. There can be no doubt though that the sacrifices made by Yang and Choi have swelled the movement to support the Gangjeong villagers in South Korea and beyond. SPARK is affiliated with the Global Network. On Thursday Peter Woodruff (who works at Bath Iron Works) drove to Portland with me for the monthly meeting of Maine Veterans for Peace. Peter was presented with an honorary membership in VFP by our President Dud Hendrick. I had requested that VFP consider giving Peter the membership status in the group for his tireless efforts for peace and conversion of BIW to building wind turbines and it was unanimously agreed. He was presented with a nice plaque, a hat, and a pin. On the 4th of July there will be the annual parade here in Bath. In recent years our local group PeaceWorks has been in the parade with banners and signs. This year we will have two huge puppets and our theme will be "For the Children" and people will carry signs that say things like education, health care, solar and wind turbines, child care, public transit, and more. Karen Wainberg has been organizing to get a good group of us to participate and we will have about 30 folks with us. My computer problems have persisted every day this past week. My computer doctor has had to come to the house each day to try to get me back on-line as something (and someone) keeps knocking me off the wireless connection. Yesterday he created a brand new wireless network and this morning it had disappeared. He is scratching his head and wondering who keeps unraveling his work. The next plutonium enabled space mission, the Mars Science Laboratory (MSL), is scheduled to be launched from Cape Canaveral, Florida between November 25 and December 18 of this year. The MSL rover, known as "Curiosity," will be fueled with 4.8 kilograms (10.56 pounds) of plutonium dioxide. It will be, NASA says, "the largest, most capable rover ever sent to another planet." NASA sadly appears committed to maintaining their dangerous alliance with the nuclear industry. Both entities view space as a new market for the deadly plutonium fuel. Back in 1997 we organized an international campaign against NASA and the Department of Energy's launch of 72 pounds of plutonium on the Cassini mission. A man by the name of Alan Kohn volunteered to help us with that campaign. Alan had been the Emergency Preparedness Officer at NASA during the Galileo (1989) and Ulysses (1990) plutonium launches at the space center in Florida. By the time Cassini was to be launched Alan had retired from NASA and felt free to speak out. He told the New York Times, just prior to the launch, that NASA had no plan to contain and clean-up after an accident on or near the launch pad that released plutonium into the environment. He said the operating plan he had worked with during the two previous nuclear launches was a joke and was only intended to serve as a reassurance to the public. Alan told us that a long-time family friend, working in the White House, had informed him that more people contacted Washington opposing Cassini than any other issue in U.S. history. While NASA maintains that they are "searching for the origins of life" on Mars, in reality they are mapping the red planet and doing soil sampling which is all intended to serve the ultimate goal of establishing a nuclear powered mining colony there in the future. The Haliburton Corporation, known for their connections to the Bush-Cheney administration and fraud in Iraq, has been working on a drilling mechanism for Mars exploration for some time. The taxpayers are being asked once again to pay for nuclear missions that could endanger the life of all the people on the planet. As we saw in Louisiana, following the Hurricane Katrina debacle, the federal government is not prepared to do disaster relief and clean-up. A plutonium release over Florida could devastate a 60-mile radius - from the space center to Disney World. It would only take one pound of plutonium-238 released as dust in the atmosphere to give everyone on the Earth a lethal dose of the toxic fuel. Have we not learned anything from Chernobyl and Fukushima? We don't need to be launching nukes into space. It's not a gamble we can afford to take. ​In what has to be one of the least fair decisions in history, a federal judge has sentenced three of the four men convicted of plotting to blow up synagogues in the Bronx and shoot down a military jet to 25 years in prison. In a case absolutely choking with troubling questions about the behavior of the FBI and a paid informant, U.S. District Judge Colleen McMahon still levied the tough sentence on three of the so-called Newburgh 4: James Cromitie, David Williams, Onta Williams. 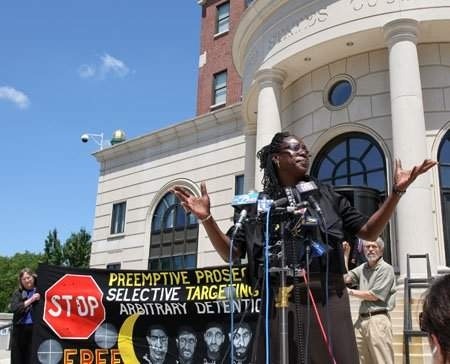 The fourth defendant, Laguerre Payen, is yet to be sentenced. McMahon herself had repeatedly raised questions from the bench about the conduct and credibility of government informant Shahed Hussain, who aggressively recruited Cromitie and plied the quartet with gifts and promised to pay them a lot of money if they went along with the alleged plot. Defense attorneys charged that Hussain, who posed as a wealthy Pakistani businessman with ties to a terror group, and the FBI basically manipulated the men into participating in the plot. "The government manufactured the criminal and manufactured the crime," a defense attorney said about the case earlier this year. David Williams told the Voice in an exclusive interview earlier this year that he and Cromitie were simply trying to scam Hussain, who they thought was rich, out of as much money as possible without actually going through with the plot, and they had no interest in actually hurting anyone. Cromitie, David Williams, and Onta Williams voluntarily agreed to target synagogues and military planes using what they thought were real bombs and missiles." The key word is "agreed." In other words, Bharara is basically admitting that the men went along with the plot, rather than hatching it themselves. This raises a disturbing question: is it proper for the government to fish for potential terrorists by going around floating phony plots to see who bites? Just asking. Another key word is "thought." See Orwell, George, 1984. All four defendants were former convicts stricken with poverty. One, Payen, was described as almost mentally retarded. None of them would have had the brains or the means to come up with such a plot, unless Hussain was there, pushing them along, and the government was there providing the ideas, the money, the equipment, the transportation and the weapons--all of which were of course fake. Alicia McWilliams, David Williams' aunt, offered the following essay on her thoughts on the case. It was written prior to the sentencing. For two months last fall, I attended every day of my nephew David William's trial. On countless days, I stood vigil outside of the Manhattan courthouse, lonely even with friends and supporters standing by my side. This week, I will go to the courthouse one last time, when David is sentenced. In its case against the so-called Newburgh Four, the government is asking that my nephew serve life in prison. David and I have been through a lot together. Coming from the inner city, we know hardship well. Drugs, poverty, crime, and disease are a constant presence in our lives. The government has generally been indifferent to the problems in our communities. David lived in Newburgh, one of the poorest cities in the state, where education and infrastructure have crumbled in the last decade. There are few initiatives that offer counseling or training to at-risk youths. But ultimately, David and I never blamed anyone for our problems, and we knew that solutions would have to come from ourselves. I have been active in my community, helping people get off drugs. I'm proud to say I've been clean since 1992 and have always worked to support others in my community, those living with HIV, ex-offenders, and more. David sold drugs to make money, and went to prison for it. He got out in 2007. David wanted to keep his younger brother Lord from getting into the same kind of trouble he had. Lord has liver cancer and almost died several times in the months before David was arrested, and David wanted to find money to pay for a transplant. David was also trying to overcome his dyslexia, get his GED, and raise his daughter. In those days, even if the government didn't help us very much it wasn't exactly out to get us either. Until 2008, that is. That's when the government sent a paid, untrained informant to infiltrate the local mosque in Newburgh, to collect information on the community there. As we learned later, he became an informant to work off charges he faced for fraud. Posing as a rich Pakistani businessman, the informant Shahed Hussain tried to engage attendees in conversations about jihad and American foreign policy. The community didn't like him much, so eventually he began hanging out in the parking lot. Eventually, he met James Cromitie, a big-talking Newburgh resident with a history of small-time crime. At first Hussain worked on Cromitie with free meals and stories about Americans abusing Muslims in Afghanistan and Pakistan. He tried to cajole him into agreeing to carry out some sort of violent crime. When Cromitie was ambivalent, Hussain offered money, cars, a barber shop and more. It wasn't enough though and at one point Cromitie cut ties with Hussain for months. After Cromitie was fired from Wal-Mart, he called Hussain to take "the job." They still needed lookouts, which the government informant insisted be Muslims. That's when David and the other two defendants, Laguerre Payen and Onta Williams, entered the picture. They were all Muslim. They were all also broke, and promised tens of thousands to hundreds of thousands of dollars. Cromitie assured them that nobody would get hurt. I sometimes wonder what would have happened if the government had never sent Hussain to Newburgh. Maybe David would have gotten into some kind of trouble again, or maybe he would have completed his GED and straightened out. Either way, he or the other men would have meant nothing to the government and the public. And David surely never would have become a lookout in a plot to bomb a synagogue in the Bronx. But the government did interfere with us. The costs for our family have been tremendous. Our lives have been torn apart. But even more is at stake. The government spent millions of taxpayer dollars on the informant's salary, perks, luxury cars, surveillance equipment, fake weaponry, helicopters, and the dramatic trial. Lawyers, rights groups, and the media have poured resources into covering the case. And the benefits? I may be biased, but I haven't met many people who can say with a straight face that our nation is safer from terrorism as a result of all this. I also sometimes wonder, what good might those resources have done if they'd been invested in our communities instead? Perhaps job-training for parolees, or education for young Newburgh residents, or programs for getting guns of the street. Maybe re-entry programs for parolees with mental health problems, like Laguerre, who is schizophrenic. Of course, many might consider spending money on these communities to be a preposterous waste of money, these days especially. I don't agree, but I can at least understand. What I can't understand is spending millions of dollars to set David and the others up, and then to put them in prison for life, which will also cost millions of dollars. Just so the government can have another notch on its belt in the "war on terror"? Or maybe I can understand. The informant needed to keep getting paid, and the government needed a few victories. 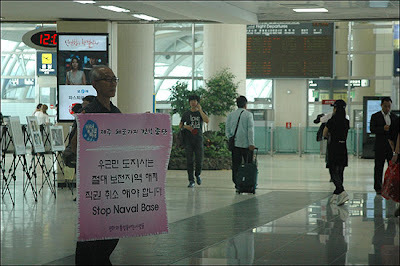 On April 23, 2011 in NYC, a performance action was held to protest the dangerous war games that the U.S. and South Korea were holding off the Korean peninsula. These massive, provocative actions involving over 200,000 troops, simulate attacks on North Korea. Last year, such "games" led to the deaths of troops and civilians. The Korean War was only stopped temporarily by an armistice in 1953, no peace treaty was ever signed, so the U.S., North and South Korea remain technically at war. The only solution is diplomacy and a peace treaty. NASA and Pentagon militarizing space for Space Warriors: ORS-1 is the Operationally Responsive Space Office’s first operational satellite. 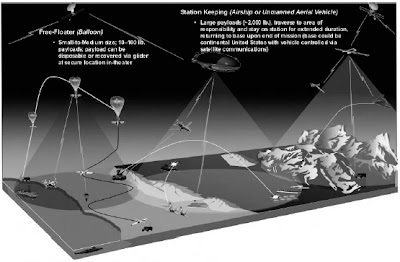 Rapidly developing and fielding ORS-1 is an important step to demonstrate the capability to meet emerging and persistent war-fighter needs on operationally relevant timelines. NASA has announced a launch window of June 28-July 10 at their Wallops Flight Facility (Goddard Space Flight Center, Virginia) for the Operationally Responsive Space (ORS-1) first surveillance and reconnaissance satellite. I'd call this new space warfare system - full spectrum dominance plus 2. Goodrich ISR Systems of Danbury, Conn., was tapped as the satellite’s prime contractor. The U.S. Air Force’s Space Development and Test Wing at Kirtland Air Force Base, N.M., is managing the program on behalf of the Pentagon's ORS Office. One idea behind ORS appears to be speeding up the process of building and launching new warfighting satellites. The Kirtland AFB website says, "ORS-1's genesis began in October 2008 following a dialogue between U.S. Strategic Command and USCENTCOM. The latter identified a requirement for enhanced intelligence, surveillance and reconnaissance assets and requested assistance from the former. Then, USSTRATCOM turned to the ORS office to examine possible solutions. ORS-1 became the agreed upon answer. In the 30 months since its initiation, the satellite has gone from the drawing board to almost ready for launch, a remarkable milestone considering most spacecraft take 7 - 10 years to design, develop, assemble, and eventually operate in the cosmos. ORS-1 has, so far, lived up to its spelled-out name." Democrats and Republicans alike love all this high-tech war making investment. It's virtually the only thing America does anymore. Democrats talk about supporting social programs but then keep voting along with the other war party to keep the military production lines humming along. One leading Democrat, a huge space technology booster, was at the dedication ceremony for ORS-1. “This is indeed a happy occasion for our U.S. military, which will be safer because of this program,” Sen. Barbara Mikulski (D-MD) said. “It is a happy day for the scientific community, which has shown a new concept of faster, quicker, cheaper can be done. And it’s also a happy day for the taxpayer." Yeah, the taxpayers are just thrilled. The truth is they know nothing about ORS-1 or its mission of enabling endless war. They know nothing about the cost of the program - either for this satellite or for those that will come after it. Deputy Secretary of Defense William Lynn (former chief at Raytheon) is a big promoter of ORS. Needless to say, Raytheon is hugely invested in the new program and stands to make a mint from it. I have pretty much been on the boat for the past 48 hours and we get many 'visitors': police demanding the passports of those aboard;'fishermen' truly outfitted in the iconic Greek striped jerseys fishing at the end of the next pier in very filthy water ..They use wadded bread as bait and by the end of the day had caught 3-4 two inch fish. Also,the son of the owner of the boat next to ours told me a stranger came by asking for the whereabouts of a boat while carefully panning our ship with his video camera. Most unusual, several days ago a woman accompanied by several men offered the crew 1000 euros each to leave the ship for several hours..unsuccessful, she returned the next day offering 500 (her strategy?) and when still no success apologized for her attempted bribery by trying to deliver several bags of groceries on board! For those of you who think I am having too good a time..yesterday I cleaned toilets and organized life jackets. Today I helped the nurse arrange the medical supplies and ran errands for the crew. We are well stocked and ready to sail..please everyone: email ambassador@greekembassy.com and demand we be allowed to sail..we have been inspected but, needless to say, haven't received any word of required changes. Since I have been on the boat so much I am quite ignorant of the bigger picture..Or course, we know the Irish ship has also been subjected to sabotage by way of its propeller shaft in a manner that could have resulted in the boat sinking when at sea and that Syntagma Square became quite confrontational. A fellow passenger who has spent time with teargas in the West Bank, says the Greek police were supplied by Israel last week and so are using the same internationally outlawed brand. I don't have any word on how Riot Dog fared..It has been interesting talking with the Greek people when I can..their economic plight is dire..think Naomi Klein's Shock Doctrine in terms of how the crisis was created by the powerful economic elite who now profit from the extreme privatization (think their islands) and further impoverishment of the population. I am sure I let you know how impressed I was by the different ages, dress etc that have come to the Square to oppose the government..
You might also know that now the Israeli press is reporting that the Americans aboard the Audacity have "violent intentions" including spraying their commandos with acid. In response we are inviting press aboard the Audacity tomorrow to inspect the boat for any potential weaponry and to interview passengers regarding their intent please keep checking www.ustogaza.org for updates..especially as I have less ability to connect online.. THE AEGIS WARSHIPS AND "MISSILE DEFENSE"
On Feb 20, 2008 the USS Lake Erie (Aegis warship) fired a modified tactical Standard Missile-3 (SM-3) at a malfunctioning U.S. spy satellite. The impact occurred at about 150 miles above the Pacific Ocean and at an impact velocity of around 22,000 mph. Many of us have long maintained that the test was really intended to prove that the Pentagon had developed anti-satellite (ASAT) weapons capability. The Aegis warship that did this ASAT test, with the SM-3 "missile defense" system on-board, is the same kind of Navy ship that will be deployed on Jeju Island in South Korea and is being used to surround China's coastal region. They are also the same ships that recently began maneuvers in the Black Sea creating tensions with Russia as the U.S. and NATO militarily encircle that nation. The Russian and Chinese don't believe that these systems are really for defense. They correctly understand that "missile offense" is an integral part of U.S. first-strike attack planning. This morning we have learned that Sung-Hee Choi's trial has been postponed again. It is now scheduled for July 15. It is startling that she remains in jail while awaiting trial, especially considering she was arrested for holding one end of a banner. It seems obvious to me that the South Korean government considers her international solidarity work to be problematic enough that they want to keep her in jail during this pre-trial period. Quite a compliment to her but unusually cruel as well. We also got word this morning that the $2,900 that I wired to Gangjeong village yesterday to help purchase another inflatable boat has been received. With the exception of $500, all of those funds were donated by the Global Network and our members. Thanks to all of you who contributed. We will look forward to seeing a photo of the new boat soon. The Global Network yesterday purchased a plane ticket for Matt Hoey (Massachusetts) to be our next board member to travel to Gangjeong village on Jeju Island. He will go in late July and stay there for two weeks. He is very excited and has been doing great work on the Facebook page that MacGregor Eddy first created. We have received an invitation from the Gangjeong leaders to hold our 20th anniversary Global Network space organizing conference in their village in 2012. At our recent meeting in Andover we agreed to do so and suggested we come soon after the first of the year. Today we heard that late February would be a good time. Our boards will have to discuss the exact timing. It would be great to bring the Global Network leaders to Jeju Island. 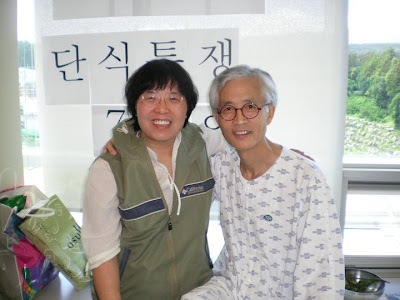 Yesterday I read that Yang Yoon-Mo is slowly eating more solid food after his 70 day hunger strike that nearly killed him. Plans seem to be for him to move to a Buddhist center at some point to further his recovery process. 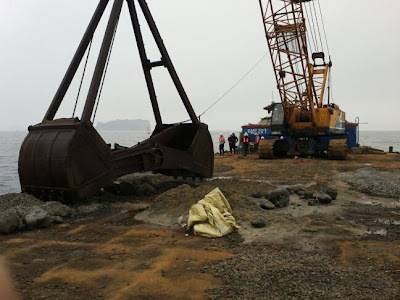 I've lately been seeing articles about Jeju Island appear in many movement publications. It is good to see that word is spreading far and wide. More of this is still needed. In addition, more peace groups need to send people to visit Gangjeong village. 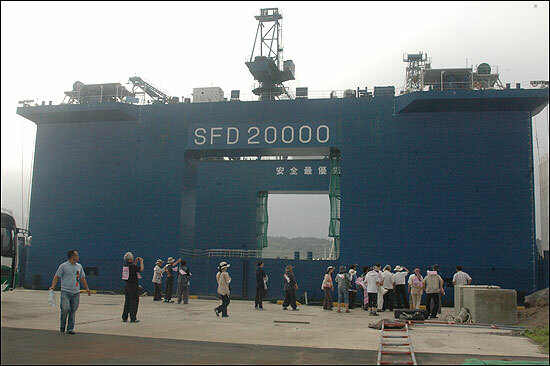 The construction of the Navy base there will surely be a trigger for a wider arms race in the Asia-Pacific region. People need to experience this calamity first hand. We got the word yesterday that Peggy Akers (Maine Veterans for Peace) will loan us her van for the 30-day Bring Our War $$ Home (and put 'em to work) Care-a-Van that we are now organizing. I plan on doing most of the 30 days, driving from one end of the state to the other, attending as many events as possible. Already local peace groups are lining up events. September 11 - October 10 will mark the 10th year of the U.S. occupation of Afghanistan which is still costing you taxpayers out there more than $10 billion every month. A steep price to pay for just one corner of this crumbling empire. On days that the Care-a-Van has no special event to connect to we will drop our big banner over a highway overpass or go leaflet the students about tuition increases and growing student debt at a nearby college campus. Or we might go stand in front of a local unemployment office with our banner or even take it to the entrance of a local hospital or shopping mall. I love doing things like this - thinking and putting in motion ways to capture as much public imagination as possible around a particular issue. It's a challenge I really get up for. Some will yell "Get a life!" but this is my life and I enjoy it. It's really all about making folks have to deal with the cost of endless war. Many people in our country don't want to think about it or they do their best to push the reality of war and occupation away from them when the subject impedes their mind space. I want to do lots of impeding during this Care-a-Van. Now that we have the van the next step is to find a crew of folks who will come along for the ride to help hold the banner, hand out leaflets, attend the local group events we visit, and more. It's kind of like a peace walk except alot more mobile. It should be tons of fun. I organized something like this back in the summer of 1997 prior to the Cassini space mission plutonium launch. We called it "Cassini Camp" and had a good group of friends come to the space center in Florida for a week of door-to-door leafleting, holding signs at busy intersections during rush hour, vigils at the Kennedy Space Center tourist facility, and more. We got alot of media coverage as we took the plutonium launch question right into the heart of the "Space coast" community. Just before the launch happened 74% of the Central Florida "space coast" community voted against the plutonium mission in a Sunday telephone poll done by the Orlando Sentinel newspaper where more than 1,200 people responded to the question. So we felt that our hard work had paid off. It's real grassroots organizing except this time it will be done on a statewide basis. Imagine that we'll have radio ads running at the same time as the Care-a-Van will be cruising around the state. One will reinforce the other. I'm getting excited. It's an organizers dream come true. Spouting the Israeli line, Hillary Clinton reveals herself to be a supreme political hack once again. These flotillas are showing the world the arrogance and hypocrisy of the U.S. and Israel. Let the ships sail freely into Gaza. Any interference with them is criminal. My time'll be up some time in June"
Her golden lips are sweet as cherry"
It was a busy weekend for me with meetings, movie, and dinner with friends. A little bit of baseball as well. My Orioles are still in last place, 14th year of losing record. 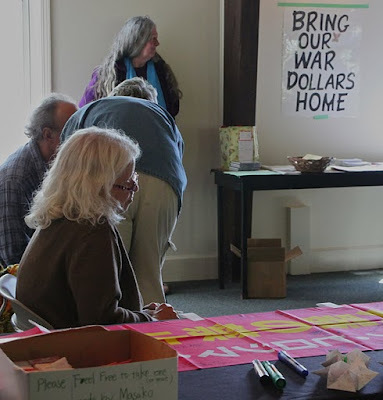 We had a planning meeting of our Maine Campaign to Bring Our War $$ Home up in Waterville on Saturday. Had good attendance and some new folks turned out which is always nice to see. It helps to move the meeting around the state now and then. One woman came from way south in Biddeford. It was her first meeting. 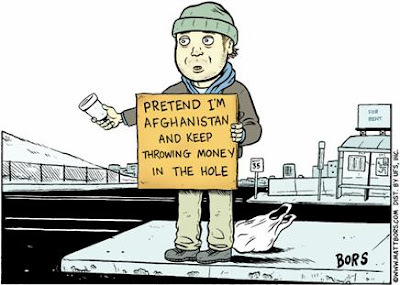 We are now organizing a month long event to be called: Bring Our War $$ Home (and put 'em to work) Care-a-Van during the period of September 11 - October 10. We are asking local groups around the state to organize some kind of event during this period that will make the connection between endless war and fiscal crisis here at home. Already organizations are lining up dates for local events which is exciting. Herb Hoffman has spoken to Rep. Dennis Kucinich (D-OH) about coming to Maine for two days during this period and he has tentatively agreed. Singer/songwriter David Rovics will be coming to Maine as well. We've now got to find a van that we can use to run up and down the state during this month of actions to bring our team of Care-a-Vaners to the local events. In the old, but still unbelievable, news category....... The Iraqi and US governments have been unable to account for a substantial chunk of the billions of dollars in reconstruction aid the Bush administration literally airlifted into the country. Special inspector general for Iraqi reconstruction Stuart Bowen told the Los Angeles Times the missing $6.6 billion may be "the largest theft of funds in national history." Iraqi officials say it was the US government's job to keep track of the funds, which were brought in as an emergency measure to keep basic infrastructure going after Saddam Hussein's ouster. Witnesses testified that millions of dollars were shoved into "gunnysacks" and disbursed to Iraqi contractors on pick-up trucks, with what seemed to be little financial controls or accounting on the part of the US government. Just imagine how far $6.6 billion could have gone in funding education, health care, job creation and the like. Brother Song, the South Korean activist that got beat up for trying to climb on-board the dredging barge off the Jeju Island coastline, has requested that international supporters raise $3,500 to help them buy another inflatable boat and motor so they can do a better job of reaching these vessels. They go out and try to plead with the workers and a couple times have succeeded in getting them to stop work. So far we've raised just over $2,500. If you'd like to donate just hit the Donate Now! button here on the blog and in the comments say it is for the boat.